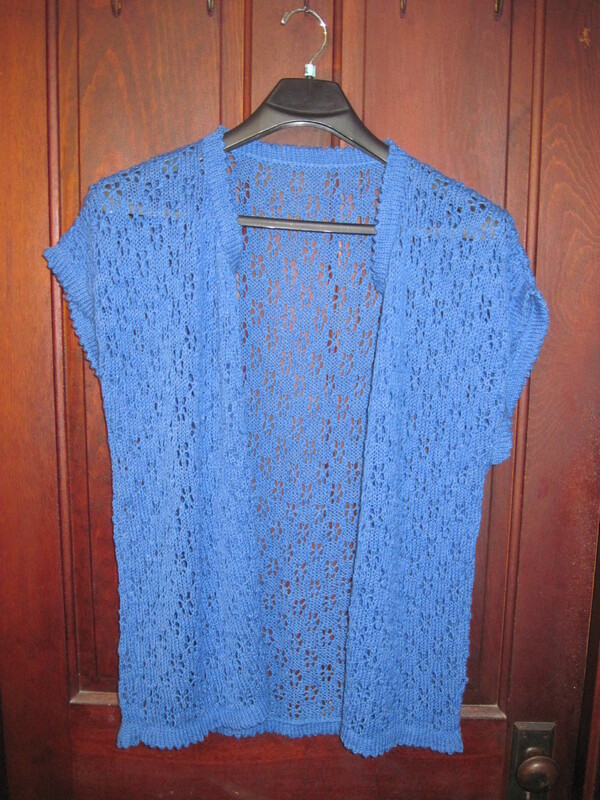 I finished the lace vest/sweater that I’ve been working on since July and got to wear it last week. The yarn was free (my favorite kind) and I’m really happy with the way it turned out. The fit is good and it was a fun and easy knit. 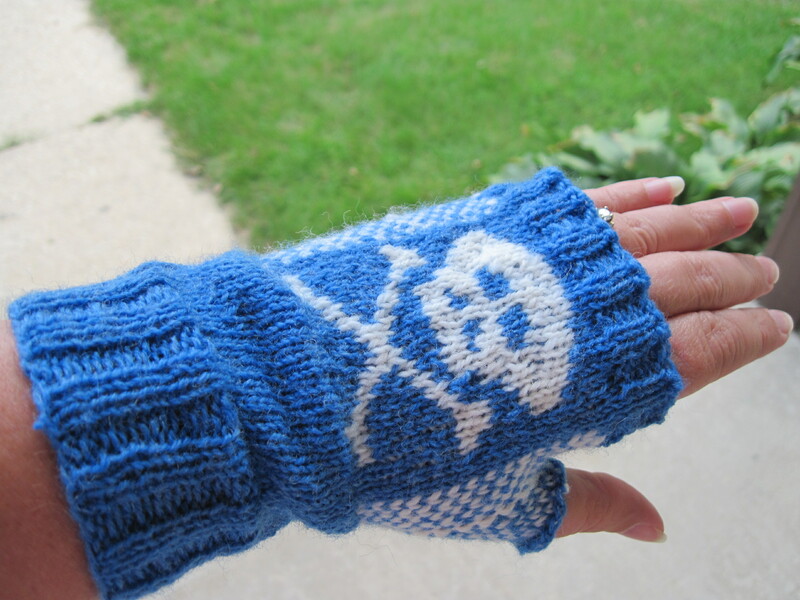 Since the blue looks so close to the blue of the Galena Pirates, I started working on a pair of fingerless mitts to wear to the games. Pam has been encouraging me to make these since last year. I scouted out some patterns and found one that looked promising, but I couldn’t figure out the instructions! Plus, my yarn was a different weight, so I refigured all the numbers, and added the white patterning on the palm and used the chart of the pirate from the other pattern. 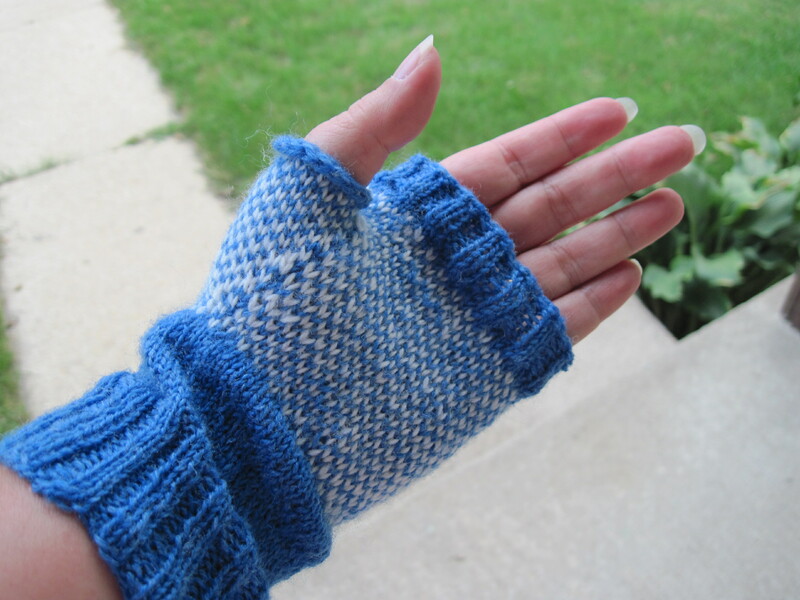 I’m pretty happy with them and I think Pam is going to want me to make lots of pairs of mitts! Because of the colorwork this one is a little snug, so I think I’m going to go up a needle size in the color area only for the second one of this pair. Then I’m going to get out my graph paper and design a different pattern for the palm for the next pair. I was hoping to be inspired into a project as soon as the sweater was finished, and I think I’m officially inspired since I’m already looking ahead to the next pair when I’ve barely started the second mitt of the first pair! Your projects are lovely. I am just learning bobbin lace and I love it. Keep spinning – it is lots of fun. Thanks for the comment. My husband is getting interested in spinning also. I don’t know if that will mean less fibre for me or more fibre for both of us! I’m wonderfully surprised by all of the beautiful and intricate pieces you’ve created!